The Clemency Board is governed by the Florida Rules of Executive Clemency and meets four times annually to address six types of relief, namely: pardons; commutation of sentence; restoration of firearm authority; restoration of civil rights; remission of fines and forfeitures and restoration of alien status. 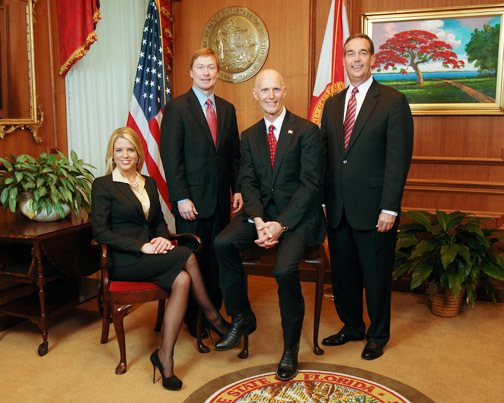 The Board met on March 19, 2014 in the state Capitol, Tallahassee, Florida and listened as requestor’s offered their testimonies. They made decisions are made to grant or deny clemency based on those testimonies coupled with the case data, history, and consideration of victim support or opposition. When the hearing commenced, there was standing room only. Florida New Majority, Jacksonville, Florida, Forgotten Majority, Jacksonville and The Ordinary Peoples Society (TOPS) Dothan, Alabama were present. TOPS attendees filled the room with a wave of star spangled bandanas tied around their mouths to signify the silencing of their vote. As the hearing proceeded, those seeking clemency would relate their story of growth and accomplishment subsequent to the commission of their crime or their release from prison. After listening attentively and carefully considering the offense, aggravating factors and any victim statement, Governor Rick Scott would take the lead in the decision by favoring or denying Clemency. However, two other Cabinet members would have to be in agreement before the request was granted. But once the Governor dissented, the case went no further. Surprisingly, the Board generously granted clemency in most cases in all areas. In some cases, the requestor was unable to be present due to distance, finances, sickness, etc. but that did not deter the Board from granting Clemency as appropriate. Some of those who received Clemency made application 10 years ago, before Gov. Scott’s time. But this Cabinet, under Gov. Scott, is responsible for denying felons the right to apply for the restoration of their rights once they have completed their sentence/probation, have paid their restitution and have no pending charges. The wait is 5 years to apply for a non-violent offense and 7 years for a violent crime. Then there’s processing time which may be upwards of 3 years unless the positions to process applications are adequately funded. It makes sense that those who continued to engage in domestic violence and have used a weapon in the commission of a crime be denied firearm authority. It makes sense that those who have not served prison time consistent with others who committed a similar crime under similar circumstances be denied a commutation of sentence. But that logic does not prevail when considering whether or not someone should be denied the right to vote because of a felony. What does the commission of a crime have to do with determining who should represent you? And if you are paying taxes, you are an unknowing victim of taxation without representation. Remember the Boston Tea Party? The restoration of voting rights does not pose a safety issue or put any citizen at risk. The time and expense of hearing those cases could be better spent. A memorable request of one applicant who had turned her life around and is now the proud proprietor of a breakfast nook said it best when she stated emphatically, “Don’t judge me for my past, judge me for what I’ve accomplished.” If we all adopted that philosophy, what a better world this would be.